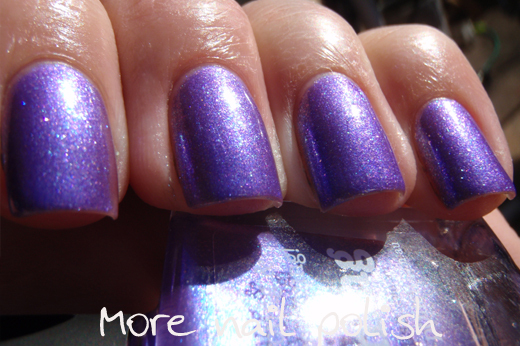 Thank you so much everyone for your feedback and comments about Picture Polish Kryptonite! Are you ready for some more Picture Polish action? I hope so, cause today is Picture Polish Blog Fest 2012. In its second year, this is my favorite nail blogging world wide event - hang on, this is the only nail blogging world wide event I know of! Today 80! nail bloggers from all around the world will all be showcasing Picture Polish nail polishes. I can't wait to see some more new colours - there are 11 brand new shades, including seven in the Collaboration Collection. You can see the bottle pictures of them all on the Picture Polish site. Today its my pleasure to bring you swatches of two of those new colours. White Wedding and Warning. 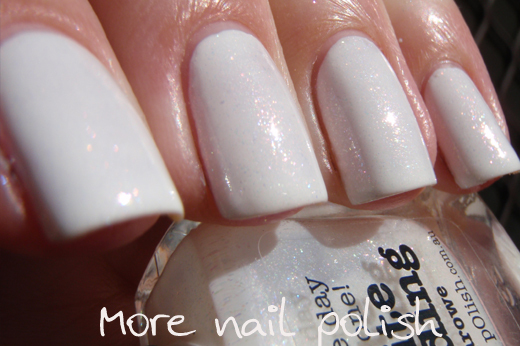 White Wedding is another polish from the Collaboration Collection, just like Kryptonite. White Wedding has been created by Leah Ann from Llarowe. White Wedding is a white jelly polish with a multi-coloured shimmery glass fleck. This is such a pretty polish and I found it so hard to capture all the glorious coloured flecks in this polish. The best one is the picture above where you can see all the multi-coloured tiny flecks against the edge of the bottle. It is so delicate and pretty, and I've not seen a multi-coloured fleck like this before. For this mani I chose to wear two coats of white wedding over a white base. You could get white wedding opaque on its own. It would take about 4 coats, but it would have that gorgeous translucent jelly finish to it. These photos of white wedding are taken in the sun, and the multi-coloured shimmery glass flecks really pop. They make the polish look like it's covered is sparkly frost, or maybe smooth shiny sugar crystals. The little catchphrase on this bottle is "It's a nice day for this one!" a cute little play on words from one of my favourite '80's singers! 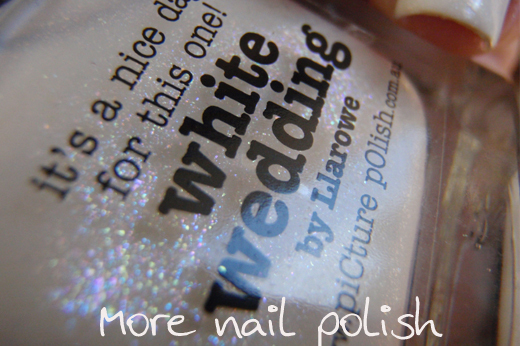 White Wedding is Llarowe's exclusive shade, therefore it will only be available to purchase from the Llarowe website or through Picture Polish online, it is not for sale via other network members. I'm not exactly sure when it will be available, but it will be soon. It will retail for $11.50 in Australia and I think it will be $14.50 on Llarowe. Warning is another new colour, although this one isn't in the collaboration range, which just shows that those girls at Picture Polish really know what they are doing when creating colours. Warning is a really complex colour and its hard to describe. It's definitely a duochrome with a bright lavender jelly base and what appears to be the same multi-coloured glass flecks. But I also see lots of blue flecks too. Its totally unlike anything else in my collection. Here are a couple of pictures of it in the shade, where the duo-chrome pops. In the sun, more of the lavender purple base shines through, and the glass flecks are super shiny and reflective. This colour really flattered my winter white fingers. It's shown in this mani as two coats with Seche Vite top coat. The catchphrase on this bottle is "for the young & the not so young". Warning will be available from Picture Polish online and through all Network members. It retails in Australia for $11.50. they recently changed their labeling, so now dark shades have labels with white print. their packaging in general, the retangular bottles are perfect for storage and I love the grippy black handles. they are Australian made and owned! 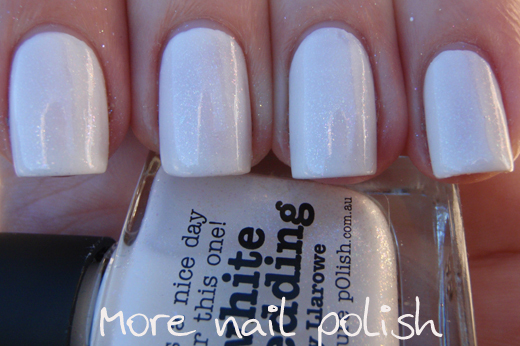 All shades, except warning and white wedding, are available now from Picture Polish. Warning and White Wedding are available for pre-order and will out in about three weeks. Ok, I'm off now to go blog surfing, I want to find the other Blog Fest blogs to check out all the swatches! Grab this inlink code if you want to add this inlink to your blog! Beautiful! Do you have a list of the other blogs who are posting swatches? I'm afraid I'll miss some! Holy hell. These are amaaazing. Crap, I'm loving all these new piCture pOlishes! Crazy beautiful. These two shades are so lovely, I now have a PP wishlist a mile long after today. Man I want all of the PP's I have seen today!! Oh Cathy, you make them look so gorgeous! Mmmm now I must have these too! I must have this shade...I'm totally lusting after it! I really like WW, especially because of the name. I wonder what it looks like over black? !